Borax is a white powder that easily dissolves in water. Made of boron and sodium, this naturally occurring compound is a very practical substance with many uses in and around the garden. Gardens overrun with ants can benefit from a borax ant trap. The Ecology Center recommends using a borax-based ant trap as a non-toxic ant eradication method. Mix a cup of sugar with a cup of borax. Distribute the mixture around anthills. 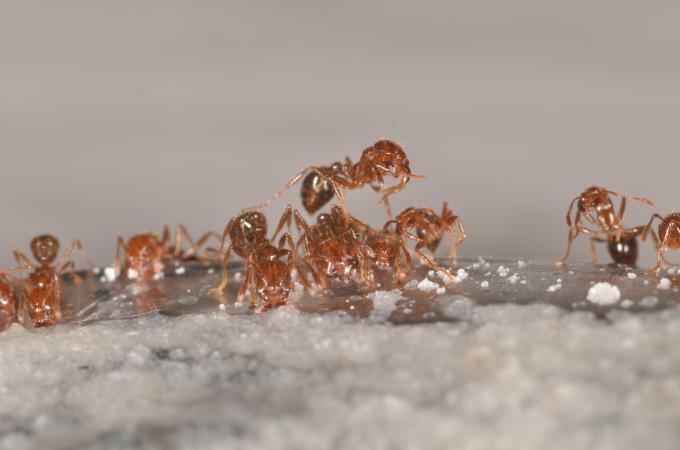 Since the borax is white, like sugar, the ants will mistakenly carry it back to their colony. There the borax will kill the ants. Borax is especially useful as a fertilizer for the sunflower plant. Borax contains the element boron which is essential for plant growth. BC Living notes that sunflowers respond favorably to a borax fertilizer. The fertilizer gives the plant strength and durability. Mix 1/2 teaspoon of borax with 1 gallon water. Water the sunflower early in the morning before the sun gets too hot. The optimal time to apply the fertilizer is before the blooms open and while they are only halfway mature. The Royal Horticultural Society notes that boron is essential for healthy plant development. Some plants suffer from boron deficiency. Broccoli displays this deficiency with hollow stalks and beets with black spots. Other crops may also develop a boron deficiency including cabbage, strawberries, cauliflower and strawberries. To confirm that plants may have boron deficiency, conduct a soil test to be sure. Add 2.5 ounces of borax into 5 gallons of water and a few drops of dish soap. Spray the solution evenly on plant foliage. Do not concentrate the solution in one area. Creeping Charley is a perennial weed that can easily intrude a vegetable garden. According to the University of Illinois Extension, borax is an effective herbicide that stops this annoying weed before it takes over the whole garden. Dissolve ten ounces of borax in four ounces of warm water. Put the solution in 2.5 gallons of water. Spray only on the lawn when warm. Do not spray if rain is expected. The University of West Virginia Extension Service recommends using borax to preserve flowers. Flowers that are preserved using borax hold their shape and seem to experience minimal shrinkage. Mix 2 parts borax to 1 part cornmeal. Sprinkle a layer of the mixture in the bottom of a box. Lay the flowers down, not touching, in the bottom of the box. Cover the flowers with more of the mixture and put the lid on the box. Let the box sit somewhere for 14 days. Borax can be used in its natural form as it is found in lake deposits. The commercial borax available is synthetically produced. It is the same as the natural form but without water. Half the commercial borax produced is mined from lake deposits in California. Borax is a cost effective substance that can be used in and around the garden to help solve a number of common garden problems and is suited for use in organic gardens. It's truly a natural wonder that has many uses in the garden and around the home.